Internet marketing, online advertising, e world sales power, and branding B2B and B2C e services solutions for your business today. Information About Jim Do it with Internet marketing style! Any person that has known me long enough will find out that I usually get straight to the sales and marketing point. Invest your time wisely. Make a difference in the world. Each individual has something special to share that can impact the world around them. Maybe your sphere of influence is one person, maybe it is your family, business, neighborhood, or a larger group of people. But, no matter how large or small a group of people that you come in contact with, a person can effect change for the good in life. We can start today with a simple business investment, with a professional word of encouragement, a "thank you", or just a kind look that really shows that you understand and appreciate another person. Jim, your online marketing specialist for B2B and B2C businesses. 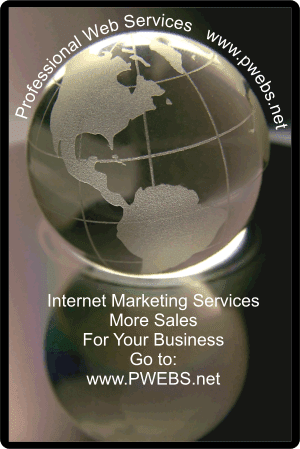 Online sales and marketing requires a multi-prong Internet-marketing approach. We can improve a web site branding design to increase customer traffic, and provide a great source for quality lead generation plus, cost effective ways to increase company sales. A proper Internet marketing and online advertising campaign strategy should target prospective customers with pleasing, informative visits, utilizing proper landing page designs. Internet marketing requires business to business (B2B) or "B2C" business-to-consumer e-business websites stay up-to-date with their critical keywords along with updated information. Increased market share, plus an increase in website traffic, leads, sales, and an improvement in the bottom line, will result from taking a proactive content management approach. Take a look at what Professional Web Services can accomplish through our excellent global marketing plans, eBusiness design ideas, & marketing and online advertising strategies that improve sales and your corporate bottom line. With our technical production ideas, effective online advertising campaigns, & smart enterprise solutions, we look forward to working as partners, in what we hope will be the start of a long, mutually profitable, relationship. To obtain a no obligation Internet marketing web site evaluation and online advertising consultation plus in-depth planning assessments, contact the eBusiness Pro global business solution leader today. For a free quote. Call or E-Mail us today! Our team provides professional worldwide corporate Internet solutions by improving your site brand design online, as an outstanding way to boost brand awareness, increase global customer sales, increase profits, and provide quality leads. Above All - Tell It Like It Is And Do It With Style! Download this press release as an Adobe PDF document. The New Strategic Marketing Directory is ideally structured toward building up, increasing revenue, and accelerating growth of a company through marketing communications, growth strategies, performance evaluations, sound marketing and advertising principles, ethics, branding, leadership training, sales processes, hi-tech public relations, National and International market development, Internet marketing, online advertising, and Global web branding. San Ramon, CA (PRWEB) January 9, 2006 -– Professional Web Services, Inc., announced today the launch of a new Global Strategic Marketing Directory, with information, resources, and services geared toward building up and expanding the market reach of new or established companies. "Strategic Marketing is probably one of the most important subject matters online. This area of business is so encompassing, especially in light of the Global Market Reach of the Internet. It touches every aspect of a B2B, B2C, and C2C business," said James Warholic, President of Professional Web Services, Inc.
Professional Web Services, Inc., www.pwebs.net an Internet marketing services, online advertising strategies, web branding solutions, and consulting services company, has just compiled and completed an in-depth evaluation of numerous International companies for inclusion into a new Internet Strategic Marketing Directory. The directory is a compilation of some of the finest Global and leading International companies for a multitude of strategic marketing, advertising and sales information, outsourcing, and out-tasking business services for established businesses, new businesses, entrepreneurial startups, Inventors, and Exporters looking for strategic solutions help to get their companies started on the right path to profitable success. The directory has information about global and International strategies for reaching new customers, intellectual property rights, copyright policies, competitive intelligence, B2B and B2C regulations, International and National laws, e business legal issues, e mail marketing procedures and regulations for proper opt in and opt out subscriptions, along with ethical issues in business such as: privacy policies and privacy rights, patent laws, and authoritative information from attorneys, financial consultants, insurance recommendations, tax services, customer relationship experts, and Internet technology experts. With the Internet causing the world to become that much smaller it is imperative for companies to have at their fingertips, trusted business resources to improve their marketing, advertising, and sales today. "We see this Internet Strategic Marketing Directory source as a resource base for businesses, as well as a place where undiscovered gems can make their talents and marketing, advertising, consulting, and sales services known to the International business world," said James Warholic. 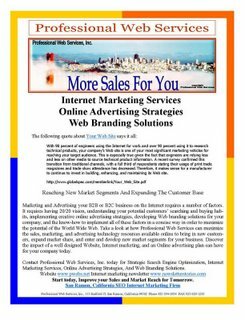 About Professional Web Services, Inc.
James A. Warholic - President of Professional Web Services, Inc.
Click the link: Professional Web Services Launches Strategic Marketing Directory to print this article for your future reference. Important! Use The Post your thoughts Button Above for Comments. Please Use The Email Form Below to Contact Professional Web Services, Inc. Many B2B and B2C companies lose track of the number one rule when a website is first launched online. Much effort goes into the Wow factor, with trying to make the site a flash advertisement or spending ten or twenty thousand dollars or more with a graphic design artist that knows very little about marketing from a SEO, Search Engine Optimization standpoint. In fact many of these graphic designed sites provide very little substance when it pertains to SEO. Most of these websites can not be found online. The majority of companies in the world are the small business types. They do not have the brand recognition of a Sears, Wal-Mart, Best Buy, or Dell. Because of the brand recognition from large companies, it is very easy to find these sites online. On the other hand, small business sites may be known by their company branding in a particular market segment but not by new customers searching for what products or services are provided. Web branding is particularly a problem in the consumer services fields such as: Realtors, Attorneys, Insurance Agents, Doctors, and Dentists. Many of these consumer services fields have taken a cookie cutter approach to building a website. In many instances the websites are built using a frame approach. This makes it very easy to put the website together for new individuals but the content is not original and can not be properly cataloged by the search engines to be included in the results for the business keywords and key phrases. Take for example a Realtor with a website from a company that produces thousands with a template driven frame system. The only difference between Realtor number one and number two is the picture and maybe the graphics on the pages. All the content within the pages are the same for all Realtors using this approach. With the large increase of Realtors in California alone, how much sense does it make, that a new site with the same content is going to show up in the SERP, search engine results pages? To be fair, while this frame approach does have certain drawbacks from a search standpoint there are some good qualities to consider. Many of the sites have built in CRM, Customer Relation Management software that makes it very easy to maintain contact with leads and customers on an ongoing basis. Internet marketing and online advertising is very fluid in the dynamics of search today. Maintaining fresh content is a key to increasing the online sales that can be generated through a website. Updating a site regularly has at least two significant advantages over others. 1: Content will be fresh for regular visitors and will likely result in return trips. 2: Search engine algorithms view updated content as a positive when it comes to ranking in the SERP. There are well over one hundred factors that play into obtaining good rankings in the SERPs. The time and money costs can be significant for business today. The solution is to leverage the talents and expertise of someone with experience that have put in thousands of hours of testing, analysis, and proven ethical concepts to improve the bottom line for your B2B or B2C business. Contact Professional Web Services, Internet Marketing Services, Online Advertising Strategies, and Web Branding Solutions. Click the link: Website Marketing and Advertising Balancing Act to print this article for your future reference. People are tired of the same ole B2B and B2C Brand thing on the Internet. When a friend was job hunting and was scheduled to have interviews at various companies he was excellent at analyzing the upper managers and VPs before he even met them. Some of the companies were on the Fortune 50 and it was very easy to find news articles related to the company or individuals in the search engines. The analysis came in the form of what was said in the self released press releases and many of the rote writing of the Bios. Creativity is not one of the stronger suits by many of top managers and it shows in the form of what I call "Bird Seed." For those that do not know what Bird Seed is, just put together the uppercase letters and you will have it. Internet marketing is becoming more about story telling, the good birdseed kind. When making a sales presentation to a customer in person the customer can get to know you. They can discover your mannerisms, learn how you respond to circumstances, and size you up on the type of character you are. Whereas, with the Internet and a company's website a person visiting can only read and visually look at pictures or videos. Sales in this case is only one way. While websites can include avatar characters, instant messaging feedback, and eventually voice over IP embedded in the site, it can not fully interact with a potential customer. The Internet is unlike any other form of advertising media. People talk about how to increase the stickiness of a website, and to a certain degree it is true that this marketing factor needs to be addressed, but for many different websites the stickiness factor is very overrated. Each industry has a unique set of keys that unlocks the door to a person's mind. Typically there are two ways that a person finds a business online. One way is they already know your website address, OR a Search Engine Search was executed with certain keywords related to what the company does. In both of these instances a customer or new prospect was seeking information about a certain topic. Once that information is found a prospect may email or phone the company to make contact. Other times, a prospect will return to read more in-depth information related to the company or industry. Hence the website stickiness factor. Search is the one major factor that makes the Internet different. Imagine, customers are already actually looking for what it is that your company manufactures or the services provided. Advertising on the radio or television is targeted to a broad market spectrum and in most cases requires many viewings of the Ad for it to have a marketing impact. Newspaper and Magazine advertising is more targeted to a narrower band segment but even with this, the spectrum is not as tight as the Web. With keywords advertising from Google, Yahoo, MSN, and other Search Engine companies open to all, in every single industry, provides the highest ROI and the most targeted of any other forms of advertisements. In fact, with at least one search company, local advertisements can be targeted to state, city, or even the local neighborhood. Simply put, no where else can you reach this type of market segment customer target groups on a 24x7 real time basis like you can on the World Wide Web. People are becoming more critical of everything written and viewed online. With the email spam that seems to flood in with hurricane force into our mailboxes on a daily basis, is it any wonder that people are calling into question everything on the Web? Yes, the Web is growing by astronomical amounts but is the information trustworthy? Taking into account the ethics factor will become more important as time goes on. Getting your company marketing message out is a daily challenge. Putting ones thoughts down in written form is definitely one of the toughest feats to accomplish. Meeting this challenge is a must in the twenty-first century. Penning the message together in a unique style will add validity to the trustworthiness of the message, the character of the company, and the integrity of the individuals. Spend the time today to do it the right way. The diversity of information online can not be contained. Click the link: Unique Internet Marketing Sales Messages to print this article for your future reference.